The Constitution of the United States is not Republican or Democrat. 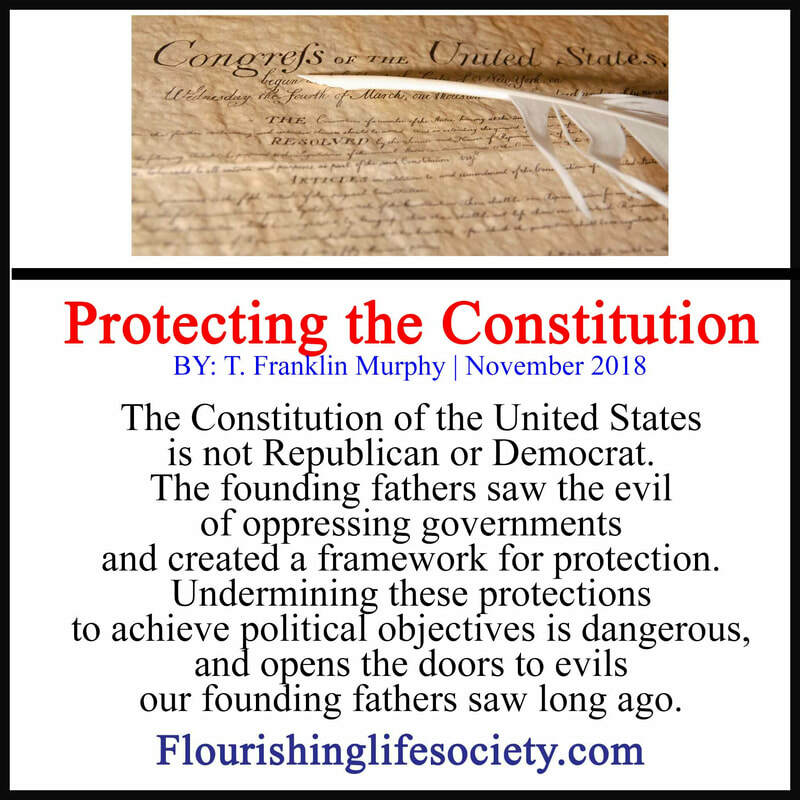 The founding fathers saw the evil of oppressing governments and created a framework of protection. Undermining these protections to achieve political objectives is dangerous, and opens the doors to evils our founding fathers saw long ago. We live in a competitive world where action is constantly scrutinized. The pressures to fight insufficiency erode appreciation for life in all its beautiful differences. The push for sameness flaws judgments. Differences threaten instead of enlighten. With powerful attacks from the narrow minded, unsuspecting victims are pelted by the swarms of mercilessness of faceless social media trolls, throwing their ignorant sticks and stones at any perceived threat presented stemming from differing points of view. Judging isn’t bad; and in some circumstances encouraged. We should judge many circumstances to ensure safety, determining who to spend precious time with or who to cast a vote for; but when these judgments disrespect others, degrading their value as a human, and suggest inferiority because they are different, we are a part of the problem. "With powerful attacks from the narrow minded, unsuspecting victims are pelted by the swarms of mercilessness of faceless social media trolls, throwing their ignorant sticks and stones at any perceived threat presented stemming from differing points of view." We rely on impressionable modes of thought that muddy the waters of judgement. We allow intuitions to direct assessments without understanding the basis behind the intuition. An intuition is no more than a belief. Many times, when time is of an essence, we must trust the intuition; but much of the time, we have sufficient resources to investigate a little deeper, challenging the first impression, and bringing other possibilities to the table of thought. With carefulness, we often discover that the underlying power feeding the intuition is beliefs carried from our youth, drummed into our minds from authority figures. Because of our youthful trust, we received and integrated their beliefs. Those beliefs, although invisible, are not dormant, setting foundations for judgments. We also integrate common social taboos, a remnant from unenlightened pasts. We rely on beliefs because of their familiarity, not necessarily their feasibility. As adeptly said by Ralph Waldo Emerson, “A foolish consistency is the hobgoblin of little minds.” (1841). We are bombarded daily with mind-numbing rhetoric. Instead of artful and supportable facts, those seeking votes lure the masses with demeaning junk, relying on unenlightened and unsupported quips to snare unthinking minds. In support of Paul Ryan, this wasn’t opinions on “Birthright Citizenship,” but very appropriate discourse on constitutionality. The suggestion that discussing the constitutionality of issues is distracting votes for the midterm elections is disgusting. Who exactly is the president trying to draw to the Republican camp? Has the Republican platform narrowed focus to such a small group of wealthy and religious that they must invite radical right-wing anarchist, believing the constitution is only to protect a select group? World poverty, immigration, and crime are worthy subjects of discussion and debate. An open border and dissolution of the law enforcement agency designed to protect America from masses of people seeking asylum is not the answer, nor is complete isolation from a world of growing problems. This, and many other issues, need more than rousing sentimentalities through factless remarks. As a republic, where people are the power, we must release the hobgoblins of our simple minds, engaging in constructive conversations that edify rather than divide. “The test of a first-rate intelligence is the ability to hold two opposed ideas in the mind at the same time, and still retain the ability to function.” F. Scott Fitzgerald, "The Crack-Up" in Esquire (2/36). Our judgments are easily skewed. Our values tend to focus on outcomes rather than processes. We need a value shift, reintegrating processes back to the forefront. Outcomes ignore heathy ethics and morals essential to a well-functioning life and nation. There will be administrations that cater more to our needs and political opinions than others. We should support and vote accordingly but not devalue the institution to achieve political strength and desired results. We must stand together to fight rogue attacks on the constitution. We can survive four or eight years of a dysfunctional executive if the constitutional powers remain in force. We are vulnerable when we allow these protections to be degraded, weakened, and misused. We should scream loud—often and early. When we acknowledge our own limitations on understanding, accepting the indefinable complexity of life, we approach differences with curiosity. We hold opposing ideas in our mind at the same time without utter confusion. We must understand different agendas benefit different segments of society. To believe one political agenda benefits all is asinine and ignorant. We are a democracy upheld by enlightened principles of protection. We first and foremost must safeguard these protections. Only then can we become part of the solution rather than perpetrating the growing ugly divide.